Welcome to the 4th annual Frigid Fondo! 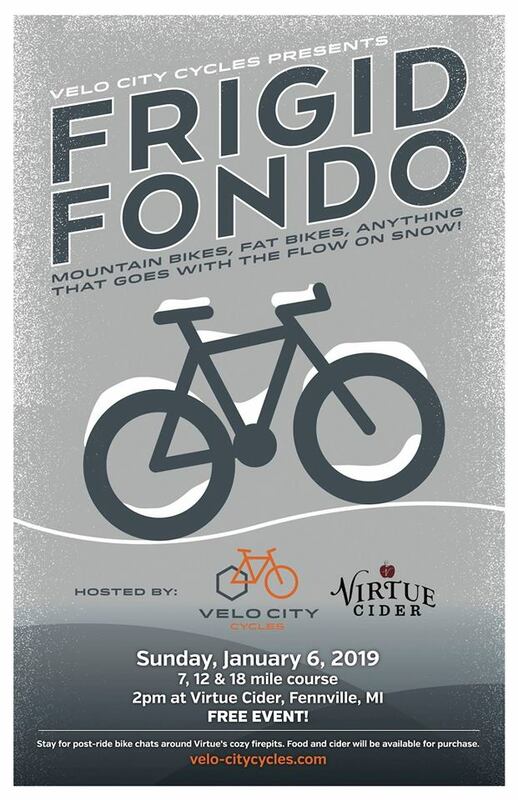 Velo City Cycles and Virtue Cider invite you to join us on Sunday, January 6, 2019, for the 4th Annual Frigid Fondo. Once on-course you can decide between a 7-, 12- and 18-mile route. This group ride will start and finish at Virtue Cider in Fennville, taking you on some great gravel roads in Allegan County. Come prepared to self support your ride. -Start and finish will be at Virtue Cider, 2170 62nd Street, Fennville MI 49408.